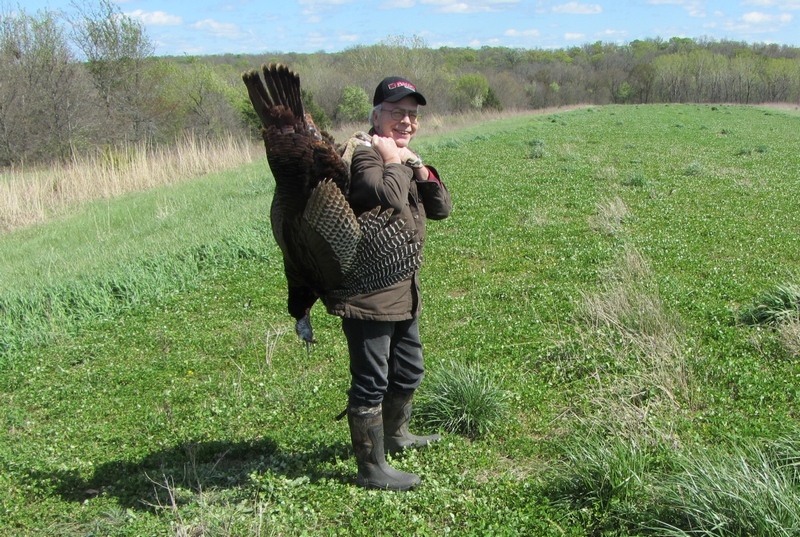 In a friendly conversation with the well-traveled Mike Farrell of Ithaca Gun Company, I mentioned how well Federal Heavyweight #7 twenty gauge turkey shells had been performing, and that it was a shame the Ithaca TurkeySlayer wasn't available in 20 gauge. I used a 12 gauge TurkeySlayer to take an especially nice bird two years ago, so nice it got the full body mount treatment as a matter of fact. As it turns out, I was wrong, the TurkeySlayer absolutely is available in 20 gauge, and one arrived in time (just barely) for this year's Iowa opener. The twenty gauge version of the Model 37 shares the basic envelope dimensions of the twelve gauge: 44.25 inch overall length, 1.375 inch drop at the comb, 2.00 inch drop at the heel, with about a 14 inch length of pull. Mine weighed in at 7-1/4 lbs., just shy of of a half pound lighter than the 12 gauge, yet still substantial for a 20. That's a good thing, a very good thing, as this TurkeySlayer is surprisingly manageable with 1-1/2 oz. Federal Heavyweight shells, the heaviest 20 gauge loads on the market, and extremely soft shooting with 1-1/8 oz. Heavyweight loads. I'll run through a few of the basic barrel dimensions and associated specifications as I measured them. Shell Used: Federal Heavyweight #7, 1-1/2 oz. The 24 inch barrel is effectively a 25 inch barrel with the supplied extended choke tube. For the M37 screw-choked twenty gauges, essentially Browning Invector Plus chokes are used, but with standard bore dimensions. The Ithaca barrel measured .614 inches inside diameter. The supplied extended choke, marked not for steel, yielded a fairly aggressive choke constriction of forty-seven thousandths. The most abusive steel loads are large diameter shot, high velocity. Federal Heavyweight #7, a tungsten composite, is neither. It does approximate #7 shot and the velocity is 1100 fps or so. Likely the Federal loads could be used, but I don't know for sure either way, and believe it or not I actually do read the directions. As the tungsten shot types are considered steel for barrel and choke selection, I used a Trulock Precision Hunter Invector Plus tube. This combination has only about a thirty thousandths constriction. Certainly you always need to pattern a shotgun, so it was a last minute trip in the rain to find out what the Federal / Trulock .029 in. combination was going to produce. I patterned at a laser-verified 37 yards, on this hunt no shot is anticipated beyond 35 yards, and the patterns were very, very satisfying. 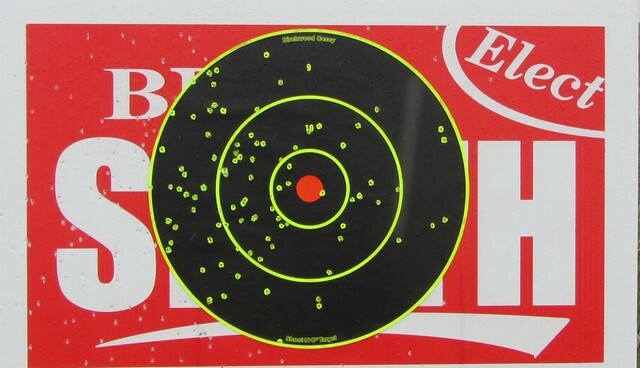 The gun shot 5 inches to the left @ 35 yards, but vertical point of impact was just fine. The culprit is the front sight that was not mounted properly, centered on top of the barrel, but obviously and visibly to the right. The 12 gauge Turkeyslayer, previously reviewed, had no such problem. The rear ram, though adjustable, was not easily adjustable as rather than set screws, the screw threads into a captured nut in the top of the ramp, the nut must be moved then the screw attempted to be screwed into it, which it would not easily do after movement. The front ramp needs to be reinstalled on this M37, but I decided holding five inches to the right was easily enough to do, if not desireable. The M37 has a 5 shot capacity, but no plug was supplied, an oversight. Believe it or not, you need one to be legal to hunt turkeys in Iowa so I rummaged throught my borderline impressive collection of plastic goodies and quickly added the appropriate rod. Rather than the usual noisy, hollow, poly-type synthetic buttstock, the Ithaca M37 stock is solid and noiseless. That's why we have the substantial weight, for a twenty, the superb balance, and the soft-shooting characteristics commensurate with the weight. The TurkeySlayer uses a 4140 chrome-moly barrel, as is the case with all current Ithaca M37 shotguns, and also has the Ithaca nitrided Perma-Guard treatment as found on their waterfowl, and other models. The action was buttery-smooth right out of the box, and the trigger is outstandingly good, breaking at a crisp 3-3/4 lbs. The Ithaca M37 has a fixed barrel, promoting consistency as it does in the DeerSlayer Models, and is about as close to a maintenance free shotgun as you'll find. Typical cleaning is just pulling a few patches through the barrel with the Otis system, which cleans the forcing cone area for you as well. As this is both a camo and a PermaGuard, there is no other routine cleaning required. 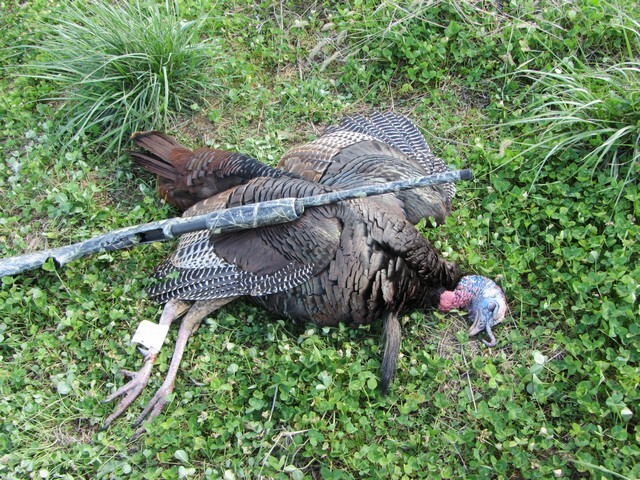 The TurkeySlayer is also an extremely versatile shotgun. You can use the Winchester 20-pellet #3 buckshot or Federal 24 pellet #4 buckshot for reasonably intimate self-defense apps, or use the 3/4 oz., 1600 fps Federal Tru-Ball rifled slug for either HD or deer hunting inside 75 yards. The Tru-Ball retains close to 1100 fps at 75 yards, about the same as several 20 gauge buckshot loads have at the muzzle. And, of course, you can go turkey hunting with it as well.